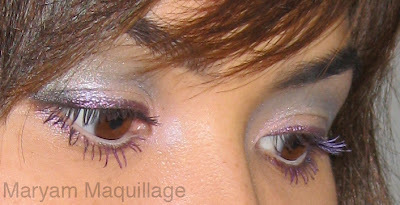 To play up my almond brownies, I used several blue, gray and iridescent purple shimmery shadows from the Coastal Scents 36 Smokey Eye Palette. I concentrated the darkest colors on the outer corners and highlighted the inner and center portions of my eyes with brighter and lighter eye shadows. 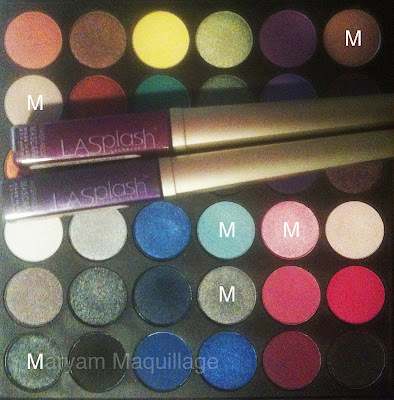 I used a purple cream shadow liner to line my top and bottom lash lines and finished the eye look with purple mascara on my lashes. TIP: Color mascaras have a tendency to make the eyes (all eyes, not just Asian) look smaller, so to counter-balance this effect, I darkened the outer corners of the eyes and extended them towards the temples a la "cat-eye" style. I also lined the waterlines using a white pencil liner for a brightening effect. Don't fear the blue eye shadow, play it down by pairing it with gray or make it more interesting with purple :) Try both and be fancy! you always have perfect lip color, I loveee this! Beautiful glow on your face. I like the way you think. I always tell people not to be afraid of wearing color. It is fun! Definitely not something to be afraid of~! I myself need to use blue more often. very pretty, i love the liner and your nails look fab! beautiful! blues and purps are always at the top of my list! That so great!!! I promote spanish designers in Qatar, it´s been over a year here and it´s been quite challenging that´s why I started the blog which is about fashion, styling tips, and how western women live in the Middle East! Beautiful look, I love these colours on you! beautiful blue on you! gorgeous! Hi Maryam. How are you my beautiful and stylish Bashkort friend? You should come to Antalya and watch the magnificent piano festival. Don't forget that music is the food of the soul. International Antalya Piano Festival is one of the best in Europe. This year, Japanese pianist Nobuyuki Tsujii, Russian violinist Vladimir Spivakov, Finnish pianist Olli Mustonen, Hungarian trompetist Gabor Boldoczki, Labeque Sisters, Russian violinist Aleksey Igudesman and South Korean pianist Hyung-ki Joo, Spanish pianist Dorantes, Polish pianist Szymon Chojnacki and Fazıl Say and other Turkish pianists will perform in 12th International Antalya Piano Festival. Hello beautiful, you have a perfect face!!! Gorgeous look- the purple really brings out your eyes! I haven't been on your blog in quite awhile and I've missed so much awesome makeup looks. This is absolutely beautiful. Purple really brought out your brown eyes!